Here we are again. Another year ending and a new one soon to begin. We are in the silly season of embarrassing sweaters and eyebrow raising prices for beach accommodation. If you are lucky enough to be staying in Thong Nai Pan for Christmas and / or New Year's Eve but haven't booked a place to stay yet, here are the options available to you. Bear in mind that minimum stay requirements will apply. New Year's is the most coveted time to stay on the beach so this is peak time plus. Some resorts might have rooms available that they are not releasing them through the net. Sandee Bungalow seems to have forgot its Christmas. Rooms for this time are only 500 Thai Baht. Nothing is available on line for New Year (I suspect they are having a holiday themselves). Buri Rasa has rooms for both Xmas and New Year. Christmas rooms start at 6,100 THB. For New Year they go for 13,700 Thai Baht. Rasananda wins the most expensive room prize. Xmas is 13,500 THB and New Year is 21,000 THB. Then there are the compulsory buffets to fork out for. Phuwadee the pink bungalow eyesores have only Christmas vacancies. Prices start at 1,200 THB a night. If you are a group of 6 or less people and you don't mind a hill walk the best value private villa rental is Sunrise Villa. Just 9,200 Thai Baht a night. That's the same price as Panviman but for 6 people not 2. The luxury villa is still available for both Christmas and New Year's Eve. Dreamland has sold out for New Year's Eve but still have some rooms available for Christmas that start at just 700 THB. The same is the case with Pingchan . Xmas bungalows cost 5,200 THB a night. Again Pen's Bungalows is not taking New Year's Eve bookings but they are taking bookings for Christmas. An Xmas bungalow will set you back a modest 1,300 Thai Baht a night. The cheapest Christmas room on Yai is found at Nice Beach Resort. Rooms start at a bargain price of 650 THB. And that's it. Longtail in Yai has their own booking system. Candlehut is with r24.org. The other accommodation options in Thong Nai Pan Yai are full. Book as soon as possible to avoid disappointment. Sunrise Villa is the best villa rental option. The villa is in Noi and has 3 bedrooms along with kitchen and lounge. For 2 or 3 couples sharing this is a great option. 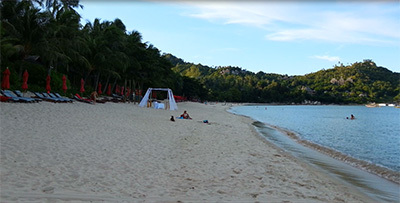 Information about the beautiful white sand beaches of Thong Nai Pan Noi and Thong Nai Pan Yai on the unspoiled tropical island of Koh Phangan.